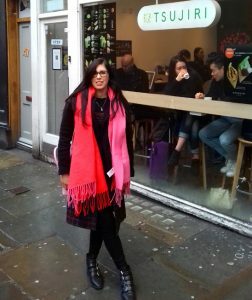 There are so many amazing places to eat and drink in London, especially if you love oriental food like me. Unfortunately, unless I go and just eat constantly throughout the day (tempting…), I can’t visit them all in one go. Tsujiri has been on my list for a while now. 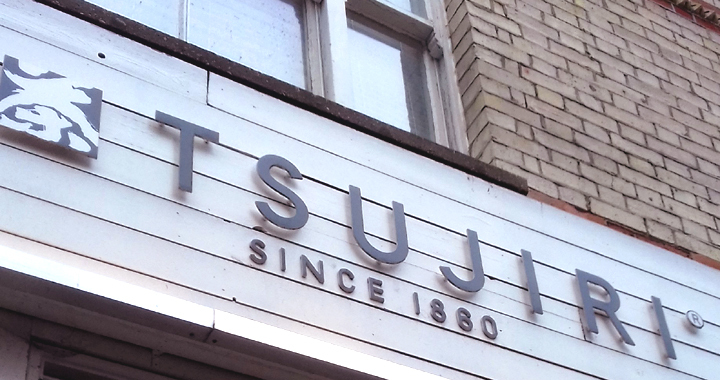 As we were in London yesterday for the day, we had a chance to pop in to the Soho Tsujiri in the afternoon for tea and ice cream. 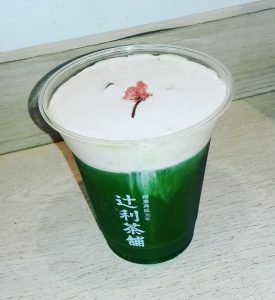 The sakura cheese foam matcha is perhaps one of the prettiest drinks I’ve seen. Topped with a pale pink dense foam with a pink sakura flower, it certainly looks Spring-like. The flavour was really unusual, but not unpleasant. As you take a sip, you get the slight saltiness from the foam mixed with the matcha underneath. It’s quite a heavy drink though, so that combined with the ice cream was a bit much after eating ramen in Japan Centre earlier in the day! The ice cream sundae was definitely the showstopper; soft serve matcha ice cream topping rice crispies, red bean and okinawa sugar (which has a sweet, caramel flavour), with mochi, chestnut and a wafer. The matcha ice cream was creamy and smooth and worked perfectly with the sweetness of the sugar and the texture of the red bean. Somehow the crispies stayed crispy even by the time I’d reached the bottom of the sundae. This sundae is definitely worth the trip to Soho if for nothing else! 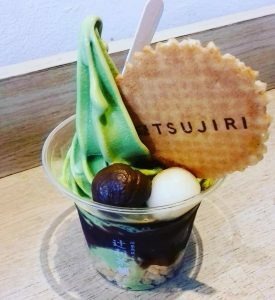 Tsujiri have quite a selection of sweets available on their menu, including their famous matcha pudding. I was really tempted to get one of these as well and take it home (as it comes in a jar), but I definitely felt a little OD’ed on matcha after my drink and sundae! Next time, I think I’d stick to a lighter sencha tea, then I’d have more room to go all out on desserts. Posted in Restaurant Reviews, Reviews, Uncategorised and tagged ice cream, Matcha, Review, Reviews, Tsujiri.